Date, time of day, and weather conditions? What were your feelings or impressions when taking this photo? 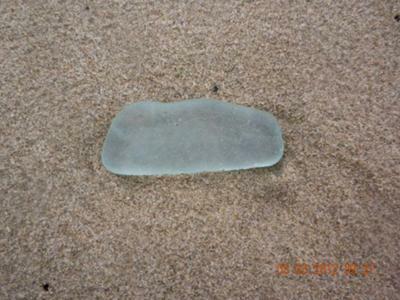 What a beautiful large piece of sea glass waiting to be discovered. What kind of camera and/or lens did you use? What tips or suggestions do you have for other photographers? Ron, What a beautiful piece of sea glass ! Nice sea glass and how wonder the size is big. Hope I can find one but think it's not easy. Join in and write your own page! It's easy to do. How? Simply click here to return to Photos General.